Remington HTP 45 ACP Auto 230 Grain Jacketed Hollow Point ammo for sale online at cheap discount prices with free shipping available on bulk 45 ACP Auto ammunition only at our online store TargetSportsUSA.com. Target Sports USA carries the entire line of Remington ammunition for sale online with free shipping on bulk ammo including this Remington HTP 45 ACP Auto 230 Grain Jacketed Hollow Point. Remington HTP 45 ACP Auto 230 Grain Jacketed Hollow Point ammo review offers the following information; Remington HTP 45 ACP Auto ammo feature 230 Grain Jacketed Hollow Point bullets. Remington Ammunition presents the shooter with an extensive variety of premium bullet developed to combine with the strict manufacturing tolerances to create ammo with which any shooter would be willing to take the perfect shot. With a muzzle velocity of 835 feet per second and muzzle energy of 356 feet pounds making the Remington HTP 45 ACP Auto an outstanding choice for self defense, personal protection, and home defense ammo. Remington HTP 45 ACP Auto ammo is new production, non-corrosive ammo that features brass casing and Boxer primers. This Remington ammo is reloadable for those high volume shooters who love to reload their 45 ACP Auto ammo. 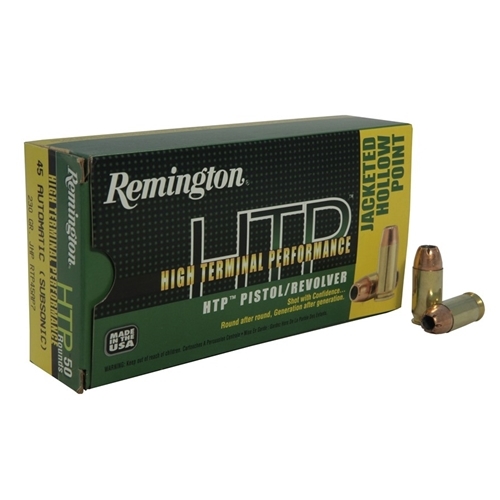 Remington HTP ammo is packaged in boxes of 50 rounds and cases of 500 rounds. 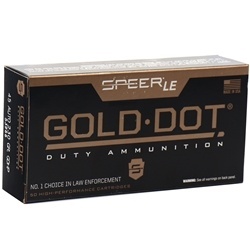 Free shipping is available on bulk case orders of this 45 ACP Auto ammunition from Target Sports USA. Remington Ammunition presents the shooter with an extensive variety of premium bullet developed to combine with the strict manufacturing tolerances to create ammo with which any shooter would be willing to take the perfect shot. With a muzzle velocity of 835 feet per second and muzzle energy of 356 feet pounds. Remington HTP 45 ACP Auto an outstanding choice for self defense, personal protection, and home defense ammo. It was a little below rated velocity at about 800 FPS in a 5.3" Glock 41, but it performed well in my ballistic testing. It did have jacket separation after going through 4 layers denim/pack of bologna/3/8" particle board and into water jugs, but expansion was BIG. Shot well in my Sig RCS 1911. Cartridge is too long for my Sig P220 compact 6 round mags. These mags are tighter than any of my other 45acp. The HPR ammo did not fit either. Good value and performance for HP rounds.